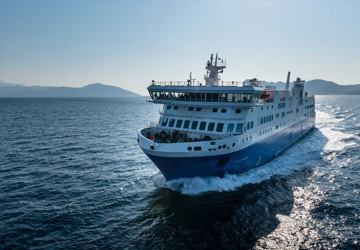 For more information, please visit our Ferries from Italy to Croatia page. 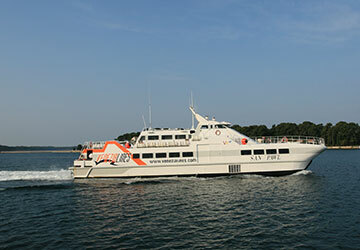 The Venice Rovinj ferry route connects Italy with Croatia and is currently operated by 2 ferry companies. The Venezia Lines service runs up to 7 times per week with a sailing duration of around 3 hours 45 minutes while the Atlas Kompas service runs up to 3 times per week with a duration from 2 hr 30 min. 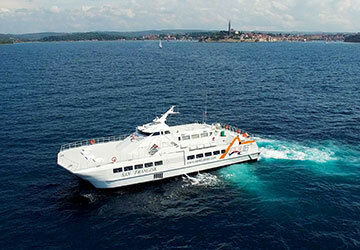 So that’s a combined 10 sailings on offer per week on the Venice Rovinj route between Italy and Croatia. Compare now and get the best fare at the time that you want to travel. "Ferry from Venice to Rovinj, Croatia"
The trip across to Croatia was great. Very comfortable and amenities were good. Would recommend. 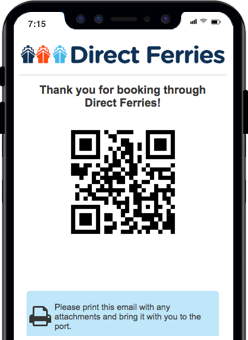 Easy booking and correct schedule information makes Direct ferries easy to use while abroad and not understand the local language. I ordered my tickets a late night 3 days ahead. Direct Ferries contacted me a few hours later and told me the ferry was fully booked. But there were avaliable seats on VIP deck for an extra fee. Everything was perfectly in order when we checked in. The ferry from Venice to Rovinj suited our travel plans perfectly. The only thing you could wish for is better information about where the terminal in Venice is located. The city of Venice is located in the north east of Italy and lies on a group of 118 islands that are separated by canals and linked by a series of bridges. The city is situated in the marshy Venetian Lagoon which stretches along the shoreline, between the mouths of the Po and Piave rivers and derives its name from the ancient Veneti people who lived in the area around the 10th century BC. The city, perhaps one of the most famous in the world, is renowned for its beautiful architecture, its views and for its works of art. The city and lagoon have, unsurprisingly, been declared a UNESCO World Heritage Site. The Venezia Ferry Terminal, Passeggeri, connects Venice to the mainland at the exit of the famous bridge, Ponte della Liberta. The new Venice Marittima Ferry Port Terminal provides a wide array of facilities including check-in desks, restaurants, shops, and many more services. The Terminal S Marta can be found in one of the port's oldest buildings and offers modern amenities including cafés, shops and other public facilities. The I S Basiliocan Terminal is where ferries from Croatian and northern Adriatic destinations arrive. Destinations available from the port include Mali Losinj, Pula, Porec, Rovinj, Igoumenitsa, Patras, Piran and Umag. The Croatian city of Rovinj lies on the western coast of Istria, the largest Adriatic peninsular, and is roughly one hour away from Trieste, 270 km from Zagreb, roughly 500 km from Vienna in Austria and around 700 km from the German city of Munich. Spread out across an oval-shaped peninsular is the city's Venetian old town where visitors can see small artist workshops which makes this part of the city a thriving cultural centre. Tucked away down narrow streets are some lovely restaurants which are complimented by chic bars located by the waterfront. The Balbi Arch, which is the last remains of the old town wall, marks the beginning of the Venetian old town which is characterised by beautiful cobbled streets along which visitors will find the Rovinj Heritage Museum, housed in a 17th century Baroque palace alongside old artist's workshops on Grisia Street. In this area all roads lead to the Cathedral of St. Euphemia that has stunning views of the Rovinj Archipelago and the Pine forests to the south, from its 60 meter high bell tower. The port is situated near the centre of the city with ferry services departing to Venice in Italy, with a journey time of 3 hours and 30 minutes when services stop en route in Porec, Pula or Piran. Direct crossings to Venice take around 2 hours and 45 minutes.